If you didn’t know already, St. Germain, the makers of the impeccable elderflower liqueur, are holding a cocktail contest, their 5th Annual Can-Can Classic. The challenge? Create an original drink using at least one ounce of St. Germain that exhibits Originality and Taste, to be judged by Representatives of St. Germain…and Martha Stewart’s editorial staff (Hey, they’re co-sponsors this year, no avoiding it). Grand Prize? A trip to Paris or $10,000. Runners up get St. Germain bicycles, perfect for gathering your very own elderflower blossoms in the Swiss Alps. For me, a significant part of the challenge is the fact that I’ve always found St. G. a bit difficult to mix with. While it’s very distinct, sweet, and wonderfully floral — almost like honeysuckle, but with notes of tropical fruit — I find Germain subtle enough to disappear in cocktails unless used with comparatively mild ingredients or added in large doses (which tends to result in overly-sweet cocktails — it is a liqueur, after all). Interestingly, though, St. Germain also seems to act as a blending agent, helping to combine disparate flavors. Oh, and it always goes remarkably well with champagne: just tip a little bit into the bottom of a flute filled with your favorite bubbly. Shake the bourbon, Byrrh, Germain and lemon with ice. 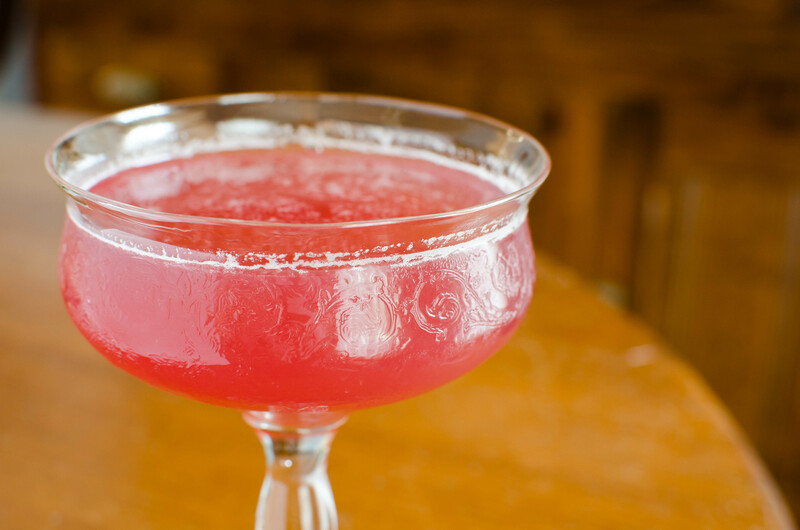 Strain into a chilled cocktail glass that has been rinsed with allspice dram. There you have it. If you know the formula of the CR#2, the construction of the Elder-Upper is easy to follow: gin is replaced by bourbon, Cointreau by Germain, Lillet Blanc by Byrrh, and the absinthe by allspice dram. The recipe listed above results in a somewhat larger drink than I would like, but contest rules are contest rules; Ideally, I would reduce everything by a 1/4 ounce. Bourbon provides a solid, woodsy base while the Byrrh and elderflower provide a fruity, floral, wine-like, tasteful counterpart, their sweetness being cut by the lemon juice. The nose is mostly spice, thanks to the allspice rinse, and it combines nicely with the sweet, crisp fruit and bourbon of the main mixture. All in all, the Elder-Upper is decidedly Punch-like. For variations, try using Laird’s Bonded apple brandy as a base: it results in a bombastically fruity drink that was my original formula but I feel that the bourbon offers a better counterbalance and backbone. Replacing half of the citrus with orange juice isn’t bad, either, and tends to smooth out the edges of the drink, eliminating that back-of-the-throat “stickiness” that tends to occur when using large amounts of lemon juice and quinine-laced wines such as Byrrh. Speaking of Byrrh, it’s very nice — quite similar to Dubonnet Rouge, being a fortified wine, but with a flavor that is a bit more like port than a sweetened red. I find that Byrrh is a bit heavier on the tonic/quinine than Dubonnet, with subtle hints of spice — cinnamon, nutmeg, and allspice — popping up in the background. 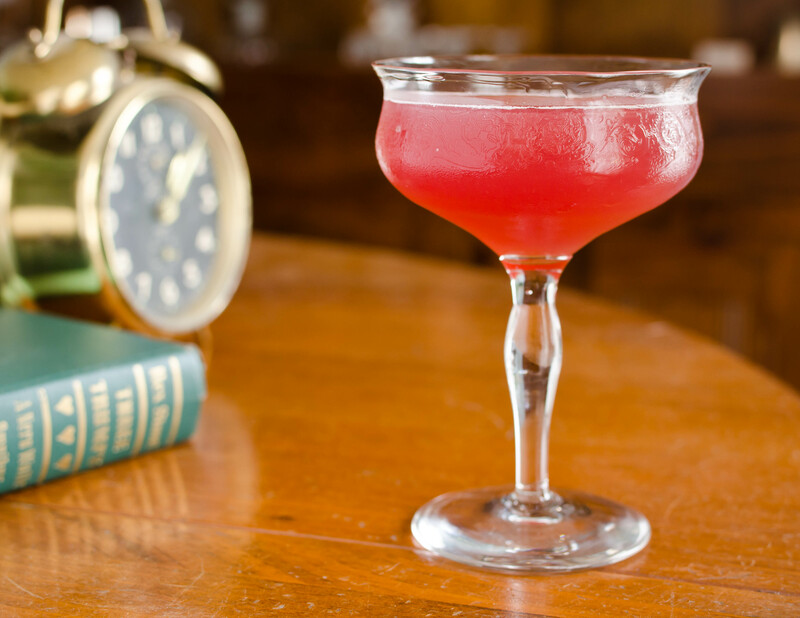 So, give the Elder-Upper a whirl if you’re a Corpse Reviver fan. Cheers! The pictures really add a sort of “visual taste” to each post; good work! And good luck on your entry! Take the money and and build this site into an empire! Ha, we’ll see guys, we’ll see. Contest ends in two days! Results will be announced in a couple weeks — I think around December 15th. This entry was posted on November 21, 2012 by IJ Lauer in Bourbon, Byrrh, Drink Recipe, Lemon Juice, Original Drinks, Pimento/Allspice Dram, St. Germain Elderflower and tagged bourbon, byrrh, cocktail, cocktail recipe, food, lemon, original cocktail, st. germain, st. germain contest.